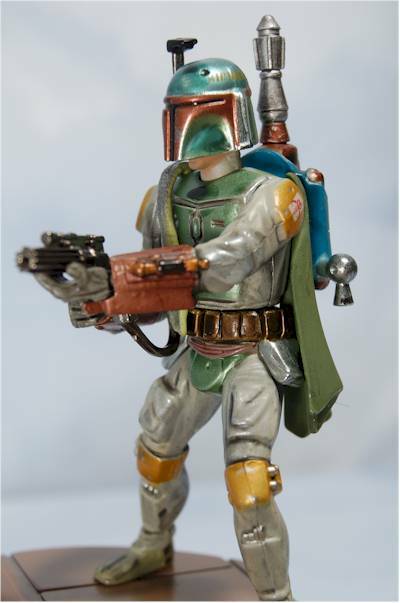 Boba Fett has always had one thing going for him - damn cool armor. He never had much in the way of dialog, and in the Original Trilogy, didn't have much back story. As we learned in the later films, the lack of a back story was a good thing. He also died one of the lamest death's in screen history, and screamed like a little girl while he was doing it. Not a particularly noble end for one of the most beloved characters in the Star Wars universe, but they did what they could to rectify that in the books. Still, kids loved him, all because of that damn suit. Oh, and the mysterious, but George has done what he can to rectify that as well in the years since the Original Trilogy. He's such a big bad in the Star Wars universe, that making anything resembling him is almost like printing money. It's no big surprise then that Hasbro decided he'd be one of two initial Titanium Series die cast figures. The other is Darth Vader, perhaps the only more beloved evil dude than Boba. If you aren't familiar with the Titanium series, it's a set of die cast vehicles (up to this point). These small scale vehicles are from all six films, and Hasbro has been really pumping them out the last couple months. The switch to actual characters is not much of a surprise, although only time will tell if we see the line continue in this direction, or stick with mostly vehicles. These are now popping up at retail locations, and run around $15 each. There are 'chase' versions of these out there with a different finish. The package is fairly large, and it's not particularly collector friendly, at least not in the standard definition. Normally, collector friendly refers to packaging that can be opened and the figure removed without having to destroy or damage the package itself. That means that a collector could put it back in the package later for storage or sale if they so desired. That's not the case here, but that's really the only fault this package has. The graphics and text are good, but it does the most important thing for a statue like this - it shows it off beautifully right in the plastic coffin. If you're a MOCer, you can enjoy this die cast figure just as much as an opener. And if you're an opener, you'll be able to get him out fairly easy and quickly. While this figure is labeled die cast, it's really a mix of metal and plastic. The majority is metal, but the hands, head, and some of the small, easily broken pieces are plastic. 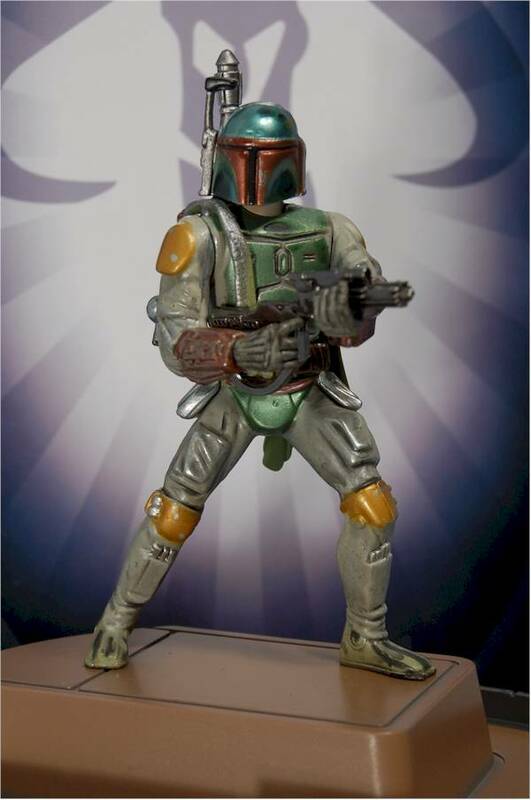 Fett is in an action pose, blaster ready. Unfortunately, the blaster doesn't fit in both hands particularly well, even with the limited articulation to help out. The deep stance looks fine though, and works as well as any choice. The sculpt is fairly rough, reminding me more of a bronze sculpture like one of those goofy cowboy statues. There's not a ton of detail work in the metal, but the major definition is there for all the critical parts. He is done in scale with the rest of the line, although I'm not sure that matters much here. You're unlikely to display him with his plastic counterparts, and the matching scale actually makes him seem more than a little redundant. But what really pulls this score down is the exposed head. This is important, because this is the first ever removable helmet Fett, showing us his true appearance. 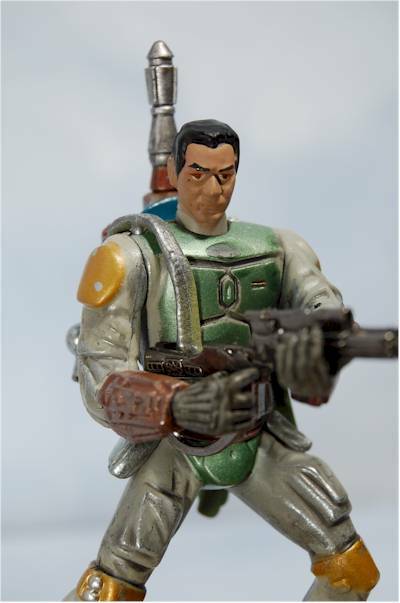 Not surprisingly, he looks an awful lot like Jango. The sculpt is poorly done though, looking more like a dollar store toy than a high end Hasbro figure. The rest of the 3 3/4" line has much better work than this. Like the sculpt, the paint ops are generally designed to hit the large details, skipping the smaller ones. While some of the application is well done, the overall style is rather sloppy and rough. And again, just like the sculpt, the feature that really pulls this score down is the hidden head. Once you slip that mask off, you'll be sorely disappointed in what you find underneath. The eyes are very uneven and sloppy, and there are stray marks on the face from the black hair and eyebrows. Overall, the quality is well below what you'd expect in the plastic version for a third the price. Believe it or not, he is articulated. The neck is cut, as is the waist, shoulders and wrists. The neck does allow you to pose the head in a couple different directions, but the wrist and shoulder articulation doesn't help with the gun issue mentioned above. I'm counting the nifty display case as one of the two accessories here. There's also his blaster, which is all die cast metal. It is intended to fit in his hands, but as I mentioned in the sculpt section, that doesn't quite work. 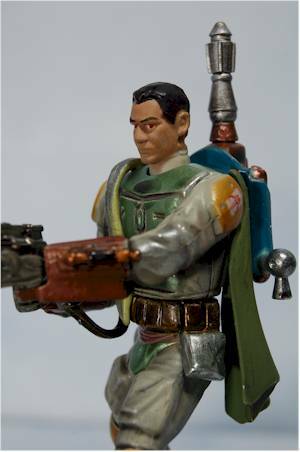 Although it hurts the appearance of the figure, you may want to keep a clear rubber band around one hand and the blaster to keep in it place, to avoid constantly having to put it back. The display case is what gives this guy his three stars in this category. It has a styling reminiscent of the ship interiors, and putting Fett up on a pedestal inside is a great idea, improving the visibility. The plexi-glass cover fits tightly, and can even be screwed back into place once you've removed the clear plastic packing inside. Some folks will be annoyed by the name plate in front (we know this is Boba Fett, thank you very much), but otherwise, it's an excellent piece of work. You're paying $15 for a 3 3/4" die cast statue. I was going to be a little rougher in this category, but I think a good chunk of the change went into the display case, which I really do like. 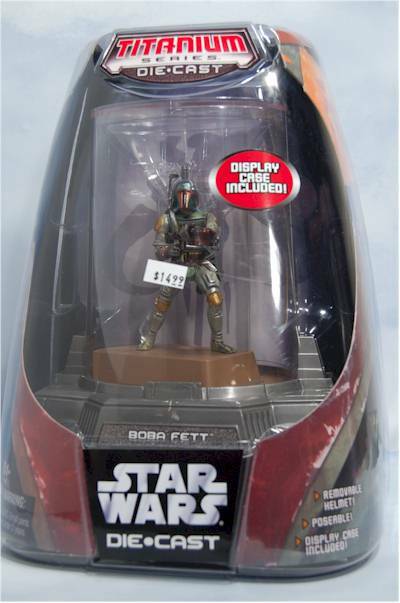 Die cast metal is more expensive than plastic, although 2.5 times is a bit of a stretch. I'm not going to hold this category against the figure in my overall score, but it's worth noting that this is not intended as a toy, but a 'collectible'. As such, there's little play value and little fun, unless you're idea of fun is staring at an inanimate object for hours on end. I mentioned this earlier, but when you get him out of his case and remove the helmet, don't discard the black plastic 'hood' he's wearing underneath. Without it, the helmet doesn't fit as well, and tends to sit too far down on his neck. 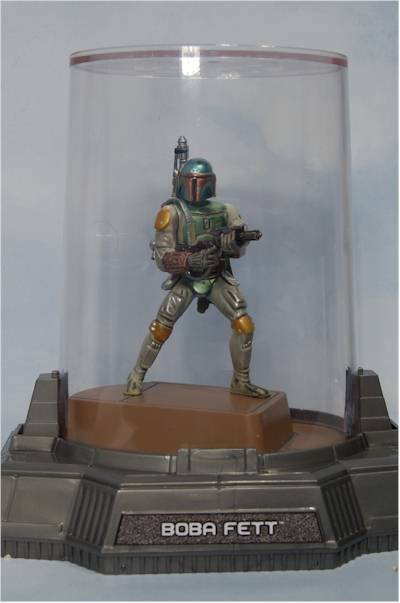 Oddly, the very best thing about this Fett (and the corresponding Vader) is the display case. And as much as I like the case, that's a problem. Die cast vehicles makes sense. The fit in nicely with other displays, and placed together can make a cool set up. 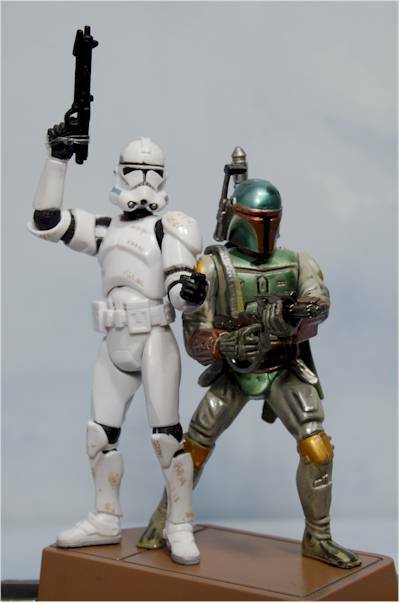 But we already have excellent 3 3/4" versions of Fett and Vader, with better sculpts and paint apps than these. So in the end, what's really the point? Are these intended for people who are afraid of owning actual action figures, lest someone think they are 'childish'? The theory would be that these are okay, since they aren't 'toys', they're 'statues'. Uh, right. In the end, they don't really fill much of any gap, and are just another excuse to convince you to spend money on something you already have. You can find him at your local Wal-mart, Target or Toys R Us, or online at Entertainment Earth, where he's sold in a set with Vader for $32. 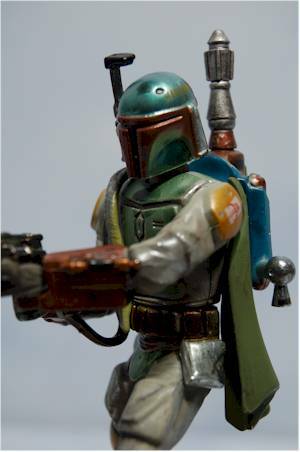 - My favorite Fett in my collection is the one from Marmit, reviewed here. - a close second is the Kotobukiya version, that I reviewed here. - here's a guest review of the VOTC version. - if you're looking for something bigger but still VOTC, here's a guest review of the 12" version. 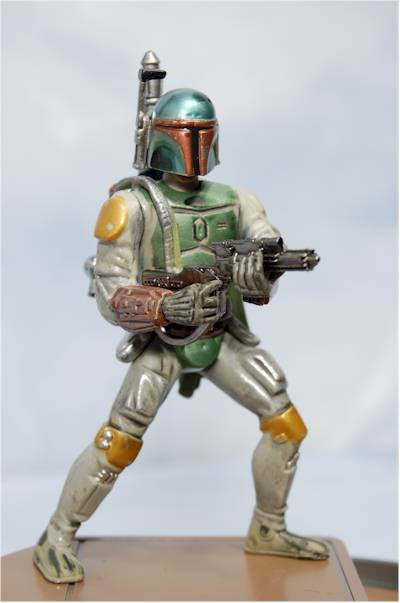 - I reviewed the Karkoon version of Boba as well, and if you're looking for something silly and cute, why not pick up the Palm Talker Fett? 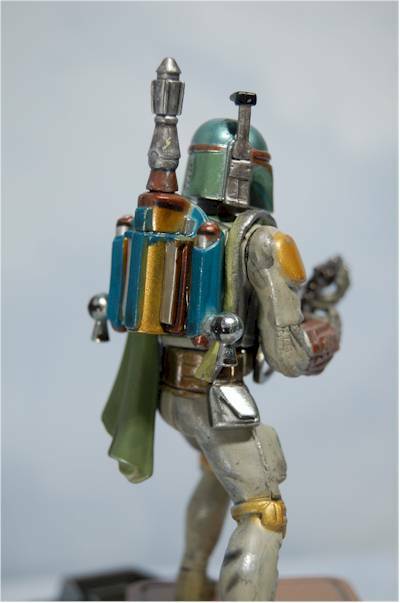 - another one of the best Fett's produced is the 300th Edition. Now how about a Sideshow Premium Format version? Or at least a 12" Sideshow version? Pretty please?